We take a simple tutorial approach to explain how option valuation can be applied in practice to the petroleum industry. We discuss a simple spreadsheet formulation, demonstrate how required input data can be extracted from market information, and give several exploration and development examples. Under the market and fiscal conditions described we derive the value of discovered, undeveloped reserves projected to result from offshore licensing in the United Kingdom, and we show how to determine the maximum amount that should be committed to an exploration work program to find those reserves. Lease-bidding and farm-out applications are briefly described. We recommend option valuation as an alternative to discounted cash flow analysis in situations where cash flows are uncertain and management has operating flexibility to adjust investment during the life of the project, and point to further work needed to fully value nested or embedded options. 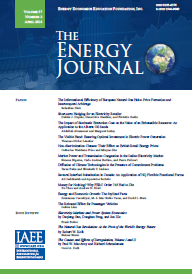 Ths paper examines trends in the structure and intensity of final energy demand in five OECD nations between 1973 and 1988. Our focus is on primary energy use, which weights fuels by their thermal content and multiplies district heat and electricity by factors of 1.15 and 3.24 to approximate the losses that occur in the conversion and distribution of these energy carriers. Growth in the level of energy-using activities, given 1973 energy intensities (energy use per unit of activity), would have raised primary energy use by 46% in the U. S., 42%, in Norway, 33% in Denmark, 37% in West Germany, and 53% in Japan. Reductions in end-use energy intensities, given 1973 activity levels, would have reduced primary energy use by 19% in the U.S., 3% in Norway, 20% in Denmark, 15% in West Germany, and 14% in Japan. Growth in national income paralelled increases in a weighted index of energy-using activities in the U. S., West Germany, and Denmark but substantially outstripped activity growth in Norway and Japan. We conclude that changes in the structure of a nations economy may lead to substantial changes in its energy/GDP ratio that art? unrelated to changes in the technical efficiency of energy utilization. Similarly, changes in energy intensities may be greater or less than the aggregate change in the energy/GDP ratio of a given country, a further warning that this ratio may be an unreliable indicator of technical efficiency. In the last 30 years, U.S. steel producers have replaced their aging open hearth steel furnaces with basic oxygen (BOF) or large electric are furnaces (LEF). This choice of technology creates the opportunity to substitute electricity for fossil fuels. We extend earlier research to investigate whether energy prices affect this type of technology adoption. The econometric model uses the "seemingly unrelated Tobit" method to capture the effects of the industry's experience with both technologies, technical change, and potential cost reductions, as well as energy prices, on adoption. Men we include the prices of electricity and coking coal as explanatory variables, the four energy price coefficients have the signs predicted by the law of demand, but the magnitude of the coefficients is such that the non-price terms are more important, e.g. a 50% increase in electricity prices would delay LEF adoption by only 12 days. Our results suggest that the adoption of LEF represents a form of major process technical change (factor biased - electricity using), rather than a price-induced technological innovation. This paper analyzes an extensive data set consisting of observations on all manufacturing establishments in New South Wales, Australia over an eight-year period. The focus is on the determinants of the demands by manufacturing establishments for different fuels (namely coal, oil, gas and electricity) and, in particular, upon the responsiveness of the demands to changes in the prices of the various fuels, the wage rate, and the rental rate on capital. Particular attention is paid to the facts that (a) establishments have different patterns of fuel consumption and (b) gas and electricity have block-pricing structures. Estimates of own-price elasticities of demand for electricity, gas and oil are higher than appear in the literature. In this paper I specify CO2 abatement cost Junctions for five different world regions. A cost-effective CO2 agreement is defined by the emissions that follow from minimising the total abatement costs, given a specified CO2 emission limit. Under the cost-effective agreement, the industrialised countries bear all reductions, while developing countries are actually allowed to increase emissions compared to the 1990 level. The developing countries will, nevertheless, bear the highest burdens under this treaty. The agreement is also analysed under different tradeable permit regimes and compared to uniform percentage reductions. The transfers from tradeable permit systems are high, and may be difficult for political leaders to justify. An allocation based on historical CO2 emissions is the only simple rule which ensures every region is better off than under uniform percentage reductions. This paper uses a Structural Econometric Model - Time Series Analysis to forecast the demand for electricity in the United States. The main innovation is to incorporate price shocks for oil into the model. The results show that if forecasts had been made with this model in the mid-1970s, they would have predicted the drop in the growth of demand more promptly than did the electric utility industry forecasts. Using current data, forecasts of demand for the year 2000 from the model are higher than industry forecasts, suggesting a reversal of the situation that existed in the 1970s. How Big is the Electricity Conservation Potential in Industry? For integrated resource planning, electric utilities require estimates of the technical and economic conservation potential. This potential depends upon the efficiencies of existing equipment, as well as efficiencies and costs of new equipment. The industrial conservation potential is generally concentrated in machine drive: electric motors and the various auxiliary technologies (pumps, fians, etc.) and process technologies (grinders, saws, etc.) to which they are connected. Most studies of industry focus on the potential due to more efficient motors and electronic adjustable speed drives. Our study of industry in British Columbia extends this analysis in two ways: (1) Alternative configurations and equipment types of key auxiliary and process equipment and connecting mechanisms are included in the database and analysis. (2) The relationship is specified between different auxiliary technologies and major steps in each production process. This allows for a more complete and dynamic estimate of conservation potential, showing how it changes as a function of structural and major process change in industry. The resulting industry-wide estimates of technical and economic conservation potential range from 35% to 40%, in the year 2010, with significant differences between end-uses (15% to 70%) and between industry branches (20% to 42%). The measurement of customer outage costs has recently become an important subject of research for the electric utilities. This paper uses a stochastic dynamic model as the starting point in developing a market-based method for the evaluation of outage costs. Specifically, the model postulates that once an electricity outage occurs, all production activity stops. Full production is resumed once the electricity outage is over. This process repeats itself indefinitely. The business customer maximizes his expected discounted profits (the expected value of the firm), taking into account his limited ability to respond to repeated random electricity outages. The model is applied to 11 industrial branches in Israel. The estimates exhibit a large variation across branches. Priority pricing of interruptible electric service induces each customer to self select a rationing priority that matches the rank order of its interruption loss. This paper extends the theory by considering the possibility of early notification, an option offered by many electric utilities. The proposed tariff structure allows a customer to choose either early notification and pay a fixed fee, or select no advance notification along with a level of compensation when interrupted. The chosen compensation determines customer service priority and corresponding price. Service priority is interpreted as an externality component of the marginal cost of system shortfall.